TechScan 1D is a mobile, easy to use badge scanner for exhibitor lead retrieval and session attendance tracking. It uses 1-D barcode technology to securely capture the unique ID from attendee’s badges. TechScan 1D fits into the palm of your hand and resembles a mobile phone. 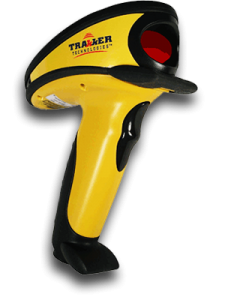 Simply point the TechScan 1D unit toward the barcode on the attendee’s badge and press the yellow scan button. Immediately the attendee’s information is saved in the memory of the TechScan 1D unit. Qualifiers and notes can be added with each scan. Current date/time is automatically saved. It is that easy! 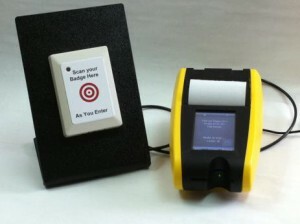 You scan the badges of attendees who visit your booth or attend your break-out session. Return your scanner to our service desk at the close of the expo. We process your collected Badge ID numbers and combine the FULL CONTACT INFORMATION as provided in the post-show registration list. In a just a day or two you will receive your leads in an Excel spreadsheet format. What are the Special Features of TechScan 1D? What are the Benefits of Using TechScan? In the past, exhibitors collected business cards and spent many hours manually entering information into databases. Session attendance was collected using sign-in sheets. Today, Hightech Knowledge has created a system that works with the TechScan 1D unit to capture and save leads in seconds! TechScan RF is an easy to use exhibitor lead retrieval unit. TechScan RF takes advantage of radio frequency identification (RFID) technology to capture contact information from attendee’s badges. TechScan RF Mobile fits into the palm of your hand and resembles a mobile phone. TechScan RF Stationary includes an integral lead printer. When an attendee visits your booth, simply push the ‘SCAN’ button and wave the TechScan RF scanner near the attendee’s badge. The reader of the Stationary unit is always ‘on’, which can be useful for unattended operation. In one second the attendee’s information is saved in the memory of the TechScan RF unit. You will be able to add qualifiers, answer survey questions and create notes regarding the conversation you had with the attendee. 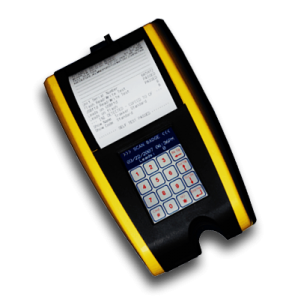 When you pick up your TechScan RF unit we will show you exactly how to use it effectively. Each unit contains a state-of-the-art RFID reader, touch-screen interface, microprocessor and real-time clock/calendar. After reading a badge, TechScan RF will instantly display the attendee’s contact information on the TechScan RF screen. Then you will be able to quickly add qualifiers, answer survey questions and add notes regarding the interest of the attendee. At the end of the show just return your scanner to our service desk. The GPRS radio in each TechScan RF unit will automatically upload your scans to our secure website. We will provide you with login credentials so that you can access your leads at your earliest opportunity – even during the tradeshow! What are the Special Features of TechScan RF? In the past, exhibitors collected business cards and spent many hours manually entering information into databases. Today, Hightech Knowledge offers cutting-edge technology to capture, qualify and save leads in seconds. Qualified leads enable a more personal, focused follow-up. TechScan 2D is an easy to use exhibitor lead retrieval unit. TechScan 2D takes advantage of 2-D barcode technology to capture contact information from attendee’s badges. 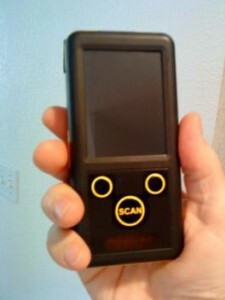 TechScan 2D Mobile fits into the palm of your hand and resembles a smart phone. TechScan 2D Stationary includes an integral lead printer. Each scan is automatically saved in the internal memory. In addition, your leads are available from our cloud portal within minutes! How Does TechScan 2D Work? 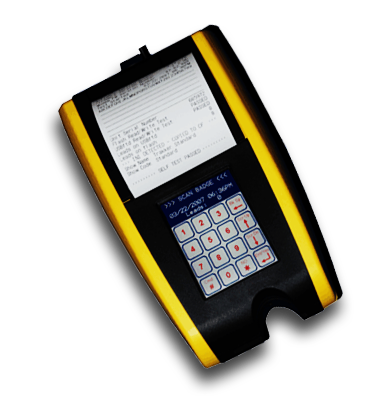 When you pick up your TechScan 2D unit we will show you exactly how to use it effectively. Each unit contains a state-of-the-art barcode scanner, touch-screen interface, microprocessor and real-time clock/calendar. When an attendee visits your booth, simply point the TechScan 2D scanner towards the barcode on the attendee’s badge and press the scan button. In seconds the attendee’s information is saved in the memory of the TechScan 2D unit. 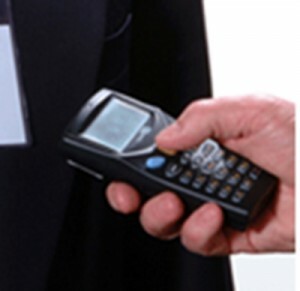 After scanning a badge, TechScan 2D will instantly display the attendee’s contact information on the TechScan 2D screen. Then you will be able to quickly add qualifiers, answer survey questions and add notes regarding the interest of the attendee. At the end of the show just return your scanner to our service desk. The GPRS radio in each TechScan 2D unit will automatically upload your scans to our cloud portal. We will provide you with login credentials so that you can access your leads at your earliest opportunity – even during the tradeshow! What are the Special Features of TechScan 2D?